This weekend is the Relay for Life in our area. For 24 hours people will walk around the High School track to raise money for cancer research. Many groups have formed teams to take turns walking throught he 24 hour period. They have also been selling luminaries which will be used to light the track in the dark and honor cancer survivors and those who have not been so lucky. My LYS - Full Thread Ahead - formed a chem0 cap team. Rather than walking around we will "knit around" and make chemo caps for donation. My Mom and I decided to join the team and after all the dance shows on Saturday we'll be "at the track." My LYS gave me the yarn - some fuzzy fun stuff for the bottom of the cap and some really soft yarn for the hat itself. I decided to get a start because I didn't think I could knit an entire hat in 2 hours or so. 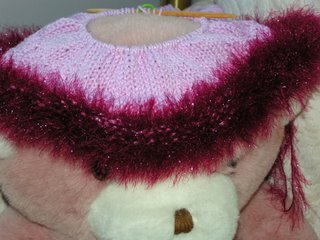 Now I had several patterns but no exact pattern for the yarn I have. One pattern said cast on 90 stitches - another 110. Since I have a big head (size not ego) I decided to make my hat on the big side. Since my yarn is thin - I cast on 120 stitches. Well - it's looking EXTREMELY big! Last night I reduced around a few rounds to reduce it to 90 stitches - hmmmmm - we'll see about this. I may have to start over . . . . Here is a website that has several hat patterns. It is called Head huggers That is the link to their patterns. If you click on the Head Huggers symbol on the top right, it will take you to the homepage which explains their mission. What a great idea your community has! Good luck with everything.